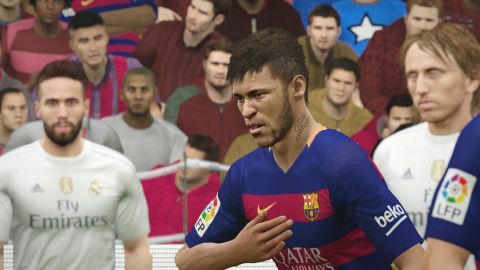 Reviewing FIFA 16 for PC is a tricky proposition. Sure, EA Canada has yet again laid out an all encompassing soccer smörgåsbord that boasts immaculate presentation and dizzying production values. Yet it's hard to fight off the feeling this season's effort feels more like a glorified DLC pack, rather than the full priced annual update you'd hope for. No Touch Dribbling. Dynamic Crossing. Clinical Finishing. Confidence In Defending. Interception Intelligence. Good lord does EA love a capitalised buzz phrase. Unfortunately, most of this year's supposedly new on-pitch features translate into diddly squat when you're looking for tangible, easily felt improvements over FIFA 15. Nearly everything that was right and wrong on the field last year remains in FIFA 16. That means slightly floaty shooting, fiddly tackling, lots of wing play and many an unspectacular tap-in dribbling over the line. Of course, it also means an incredibly solid passing game, with emphasis on satisfying buildup play and ferociously whipped in crosses. In other words, EA's chart-topping juggernaut still plays a cracking game of football... for the most part. What little that has changed revolves around subtly tinkered with passing on the ground. Previously, the FIFA community would complain that zipping the ball about a packed midfield was like a giant game of human pinball being played out between 22 millionaires. Now, though, stroking the ball even 10 yards between midfielders can feel downright glacial, with passes demonstrably slower than they were last year. It's not necessarily a bad thing—it certainly gives FIFA 16 a more realistic tempo—but given the fact many matches against the CPU are already unspectacular, low-scoring affairs, it leaves you with an experience that feels diligent, thoughtful, yet ultimately a little—whisper it—boring. FIFA 16 may occasionally give into the Dull Side of the Force, but at least it's progressive in other areas. At long last women are represented in a football game. Considering the impact last year's terrific Women's World Cup had on broadening the appeal of the sport, this is a welcomingly inclusive move on EA's part. The 12 national women's sides offered might be a little stingy in number, but it’s a start and at least an effort has been made to ensure their matches feel different from the men's game. The action is slower and more deliberate. Slightly more languid turning circles mean dribbling in tight spaces is difficult, encouraging a more robust style of passing. I found the altered pace refreshing. Whether playing as men or women, FIFA's life-swallowing online offering is stronger than ever. EA's streamlined matchmaking is so confident and reliable at this point, instantly hopping into lag-free multiplayer matches is something you instantly take for granted. And of course, FIFA Ultimate Team (the absurdly addictive card-collecting mode) is back and remains the crowning jewel. This time, the headline addition is FUT Draft; a set of one-off tournaments that reward you for putting together winning streaks. The bigger the run of victories, the better the prizes—I bagged three Premium Gold Packs for a three-match win streak, one of which gave me Messi and Aguero as loan players. This being 2015, these juicy card prizes don't come for free. You have to cough up 15,000 FUT coins or 300 FIFA points to enter a Draft tournament—the latter costing roughly £1/$1 of real money per 100 points. While you can still play the rest of FUT for free and have a grand old time winning games as you build up the Chemistry rating of your team by tweaking your squad and formation, EA's love of micro-transactions is a reminder that FIFA 16 isn't exactly great value for money. At £50/$60 for the standard edition, the lack of significant on-field improvements grates. Make no mistake: this is still an exhaustive package. There are enough licensed teams, leagues and spot-on player likenesses here to, well, launch your own brown-envelope-free rival governing body. And, unlike PES 16's pitiful PC showing, FIFA 16 is a cracking port that runs well on a variety of rigs—I played on a (admittedly monstrous) 980 TI, and the subsequent 4K/unfaltering 60fps action was totally sumptuous.